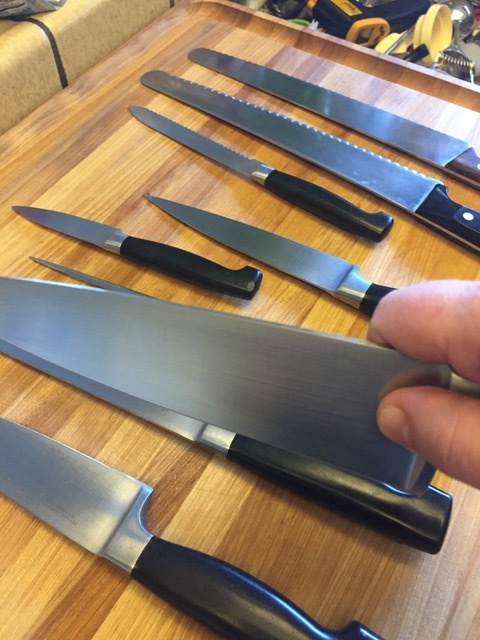 If you want to prepare quality meals at home, it’s important that you know how to keep your knives in good shape. We talked a little in the past about knives. I wanted to go more in depth as to knife types and keeping them sharp and well cared for. There are quite a few types of knives that you can use in the kitchen. The main two are a paring knife and a chef knife. The chef knife does most of the work when cutting up vegetables and cheese and things. The paring knife is great for cutting into a bell pepper and doing more close work. I have two sizes chef knife which is great when you have large and small things you’re cutting. Also, I use the smaller chef knife on mushrooms, smaller potatoes, and onions and the larger chef knife on large onions, potatoes, and butternut squash. I have a small serrated knife for tomatoes. I used to go crazy trying to slice them until I invested in the tomato knife. It’s so awesome. And I have a carving knife that came with the set. My husband loves that. When I need to carve meat, I use a large serrated knife that I bought just for that purpose. It has a different blade pattern than the bread knife. The meat knife is the one on the left and has more a scalloped edge. Also the meat knife has the bumps going towards the outside whereas the bread knife has the bumps going on the inside, if that makes sense. Finally, the kit I bought came with a utility knife. I don’t often remember that it’s there. I used to use it for cheese, if I remember correctly. The bottom line is that you need one good chef knife and one good paring knife to do the majority of your prep work. After that, you can get when you find you would use the most. Or you can be like me when I was 22 and moving in to my own place after college and thinking “I need a good knife set.” So I went to Emporium (yes it really was that long ago) and found a good set on sale. And it’s lasted me 28 years and counting. I’ve never had them professionally sharpened because I take good care of them. This was the large chef knife, small chef knife, carving knife and fork, paring knife, utility knife, tomato knife, meat carving knife and bread knife. Whew. And yet, I really only use 2 of them the most. But it is nice to have the others. The carving board is a maple one I bought off of Amazon. I had no idea how big it would be! Another tip on how to keep your knives in good shape is to use a good cutting board. Don’t cut on tile. So let’s move into the other tips. There are some simple things we can do to keep our knives sharper and happier. First off, don’t let it hang around in the bottom of your sink. Things can fall on it or hit the blade knocking it out of alignment. Wash it right away and put it away. It also ensures no rust gets on them. If you have stainless steel, it shouldn’t happen…but why take a chance. Store your knives carefully. You don’t want them jumbling around in a drawer. I have a wooden knife block that I got with my knives. If you don’t have the space in your kitchen for a block, try and find a cover for the blade to protect it. When scraping food that you’ve cut, use a food scraper. If you don’t have one, use the back spine of the knife rather than the blade side. Use the steel to hone your knives regularly. It’s actually not how you sharpen. Knives have an edge that can sometimes get folded over one way or the other. The steel helps straighten the edge of the blade. This was a great video on sharpening your kitchen knives. I have the third motorized sharpener. It reminds me…I should go sharpen my knives before Thanksgiving. And that, in a nutshell, is how to keep your knives in good shape!